April is "Autism Acceptance Month." 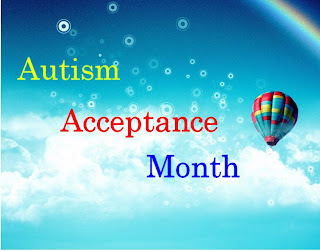 Some organizations have called it, "Autism Awareness Month," but because so much of the negative advertising of many autism charities, autistics like myself have re-titled the month, "Autism Acceptance Month." It seemed most charities only wanted to make people aware of the negative parts of autism, leaving out the good parts! I've had a tough time accepting my autism since the day I was diagnosed. The part I hate most about it is that I need help in areas and ways that other people don't. Because of that, I feel like I'm not equal to other people. So, "Autism Acceptance Month" has given me a lot to think about.